MAUNA KEA, Hawaiʻi - An Oahu high school student recently used a telescope on Mauna Kea to observe a distant planet orbiting two suns, just like the home planet of Star Wars hero Luke Skywalker. 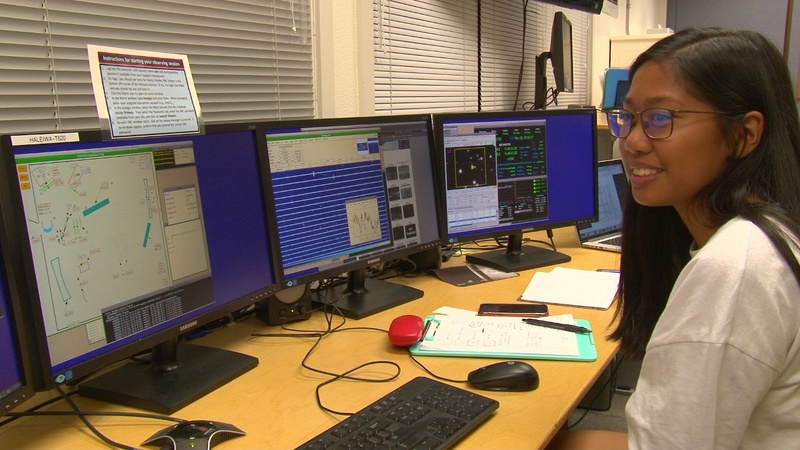 Waipahu High School Senior/Maunakea Scholar Laura Daclison during the observing run she conducted at Keck Observatory’s Remote Operations room in Waimea, Hawaiʻi. (BIVN) – An Oahu high school student recently used a telescope on Mauna Kea to observe a distant planet orbiting two suns. On November 19, Waipahu senior Laura Daclison studied Kepler-35 using the W.M. Keck Observatory, part of the Maunakea Scholars program. Astronomers compare Kepler-35 to the fictional home planet of Star Wars hero Luke Skywalker, which also famously had two suns. “So Laura is one of our Maunakea scholars students and she used the Keck Observatory to observe a what we call a circum binary system,” said Canada-France-Hawaii-Telescope Outreach Program Manager Mary Beth Laychak. Laychak helped guide and mentor Daclison during her observing night, along with Keck Observatory Support Astronomer Josh Walawender, University of Hawaii Institute for Astronomy graduate students Christian Flores and Anna Payne, and UH IfA postdoc Lauren Weiss. Daclison is only the second high school student/Maunakea Scholar to observe at Keck Observatory since the facility’s twin telescopes began science operations 25 years ago.